Pork Roast, peach salsa, and Sweet Potatoes cook in the slow cooker for this Slow Cooker Peach Salsa Pork Roast with Sweet Potatoes. This sounds like a delicious dinner for your Valentine, don’t you agree? 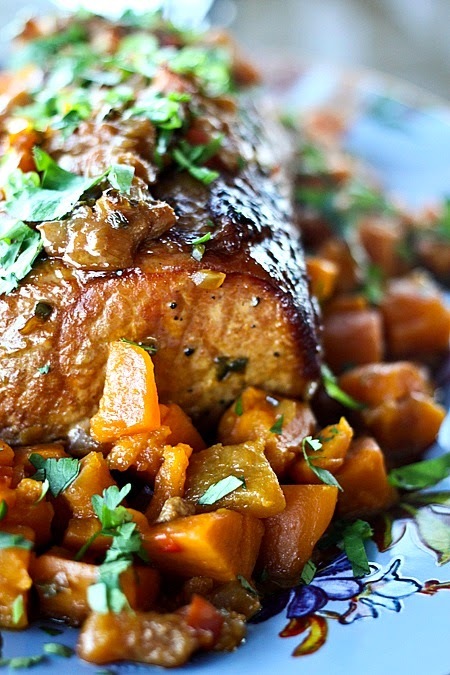 For Friday Favorites we spotlight past recipes that you may have missed, and this Slow Cooker Peach Salsa Pork Roast with Sweet Potatoes sounds like a delicious meal from the slow cooker. This even sounds special enough for Valentine’s day, which is this weekend so I hope you’re thinking about the menu! And this is a delicious sounding dinner made in the slow cooker, and all you have to do is brown the meat and cut up the sweet potatoes. Rebecca says even the browning is optional for this Slow Cooker Peach Salsa with Sweet Potatoes, but she confirms what I always say, that browning will add more flavor. Rebecca uses her own home-canned peach salsa for this recipe, but we will not report you to the from-scratch food police if you use peach salsa from a jar! For serving: cooked rice, chopped cilantro or parsley, chopped green onions, spicy sesame oil and/or Spicy Chinese Chili Garlic Sauce (optional). Get the complete recipe for Slow Cooker Peach Salsa Pork Roast with Sweet Potatoes from Foodie with Family. Great recipe but I have one suggestion. If you aren't familiar with the peach salsa you are using, taste it before you pour it on. It turned out the one I used (Mrs. Renfro's) was very mild and had I known that I would have added some spices for more flavor. But I added some garlic, oregano, cumin, salt, pepper and smoked paprika to the sauce and thickened it with a little cornstarch. My family loved it! I'll be on the lookout for some different peach salsas and probably some mango and pineapple too! Amy good suggestion! I'm glad you enjoyed the recipe. Thanks for sharing my recipe, Kalyn! I so appreciate it. And I echo the call from Amy to taste your salsa first. I know the salsa I made is super garlicky and very flavourful, so it didn't need much else!